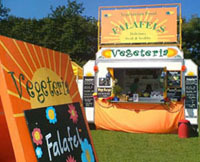 Vegeteria are vegan and vegetarian festival caterers specialising in freshly prepared Mediterranean foods. 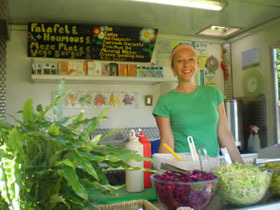 Our signature dish is organic Falafel which is served with a delicious selection of salads and sauces. Each one is made to order and finished with a mouth watering pickled chilli. Vegeteria provide outstanding food at competitive prices served by enthusiastic, staff......whatever the weather! We have three different stalls we can trade from. Our brightly decorated custom built trailer is ideal when space is limited and requires less staff and set-up time making it perfect for the smaller events we attend. 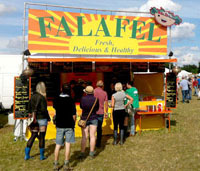 Our marquee stall is a beacon for Falafel lovers, using a brightly coloured marquee as the servery this stall can serve at a much higher capacity than the trailer making it more suited to the larger festivals we attend. New last year we thought we'd have a bit of fun and create a stall that complemented the Mediterranean origins of our food. 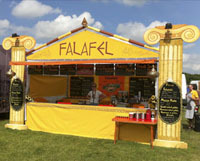 Complete with mosaic seating and four meter tall columns our 'Falafel Taverna' will add a quirky touch to any festival.